Don’t miss the article by Gary Taubes in the new “Special Food Issue” of Scientific American Magazine, titled, “Which One Will Make You Fat? Rigorously controlled studies may soon give us a definitive answer about what causes obesity—excessive calories or the wrong carbohydrates” (September 2013). 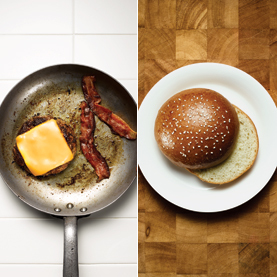 It features a picture of a skillet containing a burger with cheese and bacon and a plate with a bun on the opposite page. Image: Travis Rathbone; Food Styling by Liza Jernow. Gary Taubes, NuSI, Peter Attia. Bookmark. That is fabulous!!! If they want a volunteer for the LC way of eating, I will do so gladly! Thanks for sharing. I did not read the entire article, but did it address the anomaly of slim Asian people that eat a whole lot of rice? Hi Nancy. Perhaps this is a question that will be answered by the research. Great news about the research! That was a good question by Nancy, about slim Asian people who eat a lot of rice. Anecdotal experience only: I have observed high intake of vegetables sauteed in generous amounts of oil, to go along with the rice. Plus, the meat (or substitute) is sauteed in oil as well. These things I have experienced either through Chinese restaurant work experience where employees ate nightly dinner with the owner family, or where I frequently ate dinner with friends from India. I look forward to the research results. Thanks for the post! Hi Kimberly. I saw some statistics the other day that said that China and India now have the highest rates of diabetes in the world, so maybe it isn't working out so well for them either. It may be that traditional fats are protective when eating a high carb diet and vegetable oils and trans fats are now part of Asian diets as well as ours. I suspect that sugar consumption has also skyrocketed around the world as well, so that puts fructose in the picture too. (Rice is all glucose.) We shall see. Referring to Nancy's comment above: Perhaps Asian people are able to handle the glucose (not as bad as fructose) in rice, because they do not also fill their bodies with massive amounts of sugar and white flour, the same way North Americans do. Therefore, their metabolisms remain healthy and their bodies can deal with the glucose from rice.